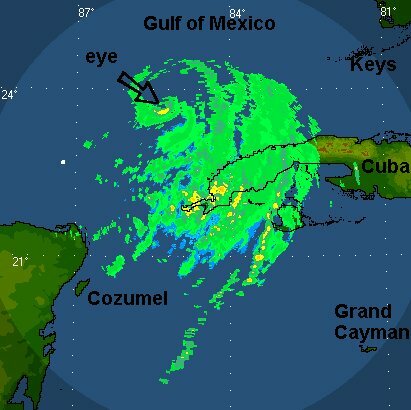 Ike made it's way into the Gulf off of the west coast of Cuba around 5 pm edt today. Officially it is at 75 mph. A closer estimate is probably 70 mph. The last several recons did not report hurricane force winds at the surface. The last report was 71 mph. Ike will likely become a major hurricane again. The forecast track has shifted some again, this time northward. A strong trough will abruptly turn Ike northward about the time it makes landfall. This timing is absolutely critical. If the trough is faster, it will pick up Ike and turn it northwest sooner. If the trough is slower, it will allow Ike to move inland farther south, then turn northwest once inland. Interests along all of the Texas coast needs to follow the path of Ike closely. 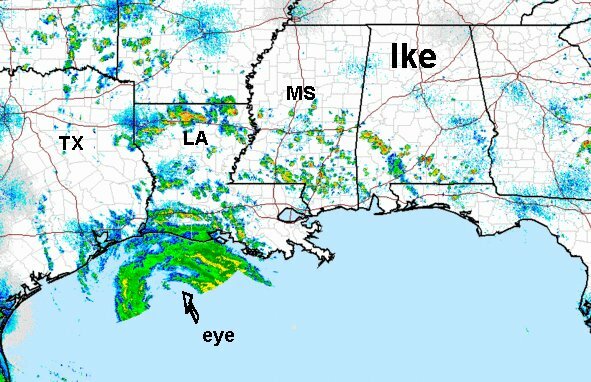 If Ike turns faster, some of western Louisiana could be affected by outer bands. This Ike forecast is again the perfect example of why we don't look at the details of an extened hurricane forecast. Timing of the troughs can be critical for landfall points and models simply can't forecast that well four or five days out. NHC's forecast track looks reasonable at this time. They are taking the middle road between the model extremes and moving Ike toward the central Texas coast. Please don't panic. Long range forecasts often change by large margins. Stay updated with the latest forecast. 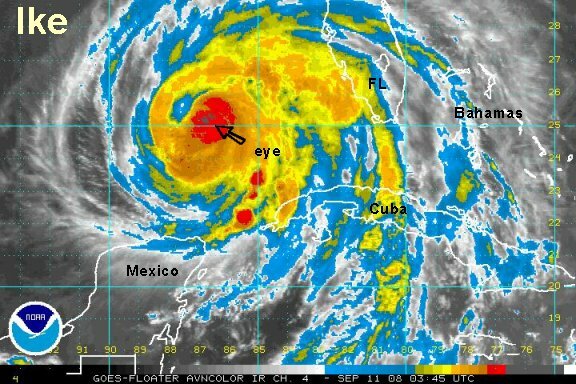 Just hours after Ike passed off of the northwestern Cuban coast the eye became very apparent again. 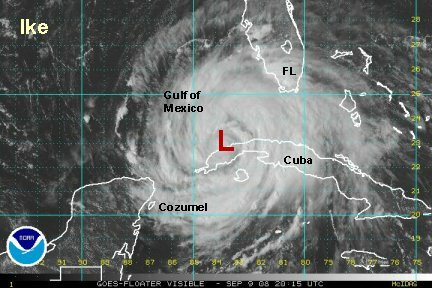 NHC has estimated that top sustained winds are 80 mph on the 2 am edt advisory. This seems reasonable to us. 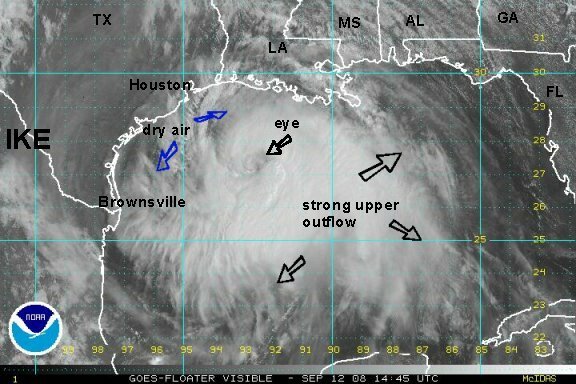 Ike is getting organized fairly quickly and we expect Ike to become a major hurricane again as it moves toward the central Gulf. 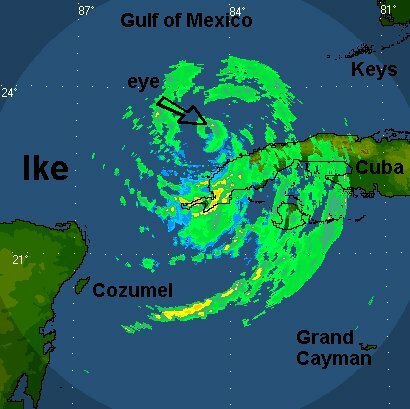 The Hurricane Hunters will be checking out Ike late tonight. Squalls have been buffeting the middle and lower Florida Keys Tuesday and into Wednesday morning. There has been some flooding, an isolated tornado and gusty winds. Winds have gusted to near 60 mph at Key West earlier and closer to hurricane force on Sand Key light station. That reading is measured at 150 feet above sea level though. The forecast track is still divided as explained on the previous update. One of the more reliable models brings it in about 50 miles north of Brownsville then into west Texas. The other model turns it quickly before landfall and up to Galveston. We will watch the next few model runs closely to see if any trends develop on which model has the best handle on the situation. Again, NHC splits the difference and moves Ike into the central Texas coast. This seems to be a reasonable forecast at this time. Please don't panic. Long range forecasts often change by large margins. Stay updated with the latest forecast. Next update:Late Wednesday morning. Ike is centered at about 23.9 N / 85.2 W or about 800 miles east southeast of Corpus Christi, TX Top sustained winds are at 85 mph as of the 8 am edt advisory. Ike is transforming itself into a better organized hurricane. Earlier the strongest winds were only in a tiny area around the eye and well away from the center in strong bands. Now, Ike is developing a solid CDO (central dense overcast) in which it can become stronger. The pressure is already very low. The 7:45 am edt Hurricane Hunter fix had 959 mb. The top surface wind measured was 90 mph. We were sort of surprised that NHC didn't make it 90 mph instead of 85 mph. The forecasts are mostly going with the rapid north recurve after landfall. They are clustered toward a landfall point on the central Texas coast, or just south of there late Friday evening or early Saturday morning. 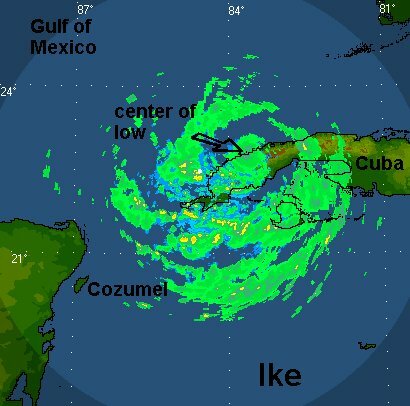 Ike has the potential to make landfall as a major hurricane. Please don't panic. Long range forecasts often change by large margins. Stay updated with the latest forecast. Next update:Wednesday Afternoon. Ike is centered at about 24.2 N / 85.8 W or about 750 miles east southeast of Corpus Christi, TX. Top sustained winds are at 100 mph as of the 2 pm edt advisory. Ike is moving nw at 8 mph. Pressure is 958 mb. Ike is still evolving with clouds obscuring the eye. It appears that the west side still has some dry air, and a tiny bit was caught into the circulation. Overall the CDO (cloud mass near the center) is still growing. The outflow aloft is still excellent for the exception of the west side. Even there it seems to be improving some. The recon did not confirm surface sustained winds of 100 mph. The pressure is certainly low though and the recon may not have sampled the highest winds. The latest forecasts show little change, for the exception of being about four or five hours slower. Right now, the central Texas coast looks to be the landfall point early Saturday morning. A few hours after midnight is the mostly likely time. Heavy rain should move toward the Hill country before moving northward into Oklahoma by Sunday. Very heavy rain is likely with totals over 10" possible. Please don't panic. Long range forecasts often change by large margins. Stay updated with the latest forecast. Next update:Wednesday Evening. Ike is centered at about 24.7 N / 86.3 W or about 700 miles east southeast of Corpus Christi, TX. Top sustained winds are at 100 mph as of the 8 pm edt advisory. Ike is moving nw at 8 mph. Pressure is 947 mb. Ike's pressure is still dropping, indicative of it becoming better organized. This still has not been realized with increased wind strength measured by the recons this afternoon and evening. It appears that the dry air ingested earlier is still having an effect on strength. The Euro model is troubling again with a landfall position near Galveston, TX Saturday morning. Since it is going back and forth on this solution, we are not ready to believe it. The other models stay with the central Texas coast late Friday night. Please don't panic. Long range forecasts often change by large margins. Stay updated with the latest forecast. Next update:Thursday Early AM. 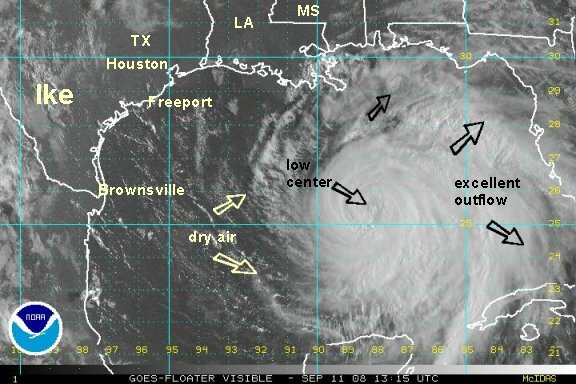 Ike is centered at about 25.0 N / 87.2 W or about 645 miles east Brownsville, TX. Top sustained winds are at 100 mph as of the 1 am cdt advisory. Ike is moving wnw at 9 mph. Pressure is 946 mb. Ike's eyewall is starting to thicken, especially on the northeast side. It is a very large hurricane which can stir up high seas. Dry air continues to nip at the western part of the circualtion. Aloft, upper air conditions continue to show excellent outflow in most directions. High Winds Hurricane force winds extend out to 115 miles and tropical storm force winds out to 230 miles. Storm Tides Already 3-5' in the tropical storm warning area. Rainfall/Flooding Western Cuba will continue to get heavy rain with totals in the 10-20" range. The coastal areas from Florida to Louisiana will see outer bands producing locally heavy rain of 2-4". A heavy rain threat will develop Saturday into Sunday from central Texas into Oklahoma. Seas Buoys now are measuring seas over 20' in the northeastern Gulf of Mexico. Seas up to 40' are possible near the center of the hurricane. It appears that the models are leaning more toward the Euro solution, but nor that far north. 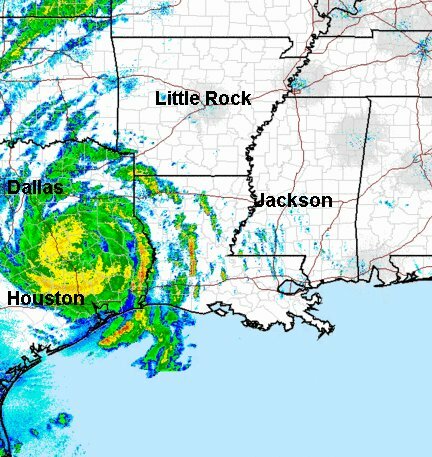 Right now between the central and upper Texas coast is looking more like the landfall point. Keep in mind, with Ike being so large, near and well north of where the center moves inland will see substantial effects from Ike. Landfall is still looking like late Friday night or early Saturday morning. Please don't panic. Long range forecasts often change by large margins. Stay updated with the latest forecast. Next update:Thursday Late AM. Ike is centered at about 25.8 N / 88.8 W or about 440 miles east southeast of Corpus Christi, TX. Top sustained winds are at 100 mph as of the 1 pm cdt advisory. Ike is moving wnw at 10 mph. Pressure is 952 mb. Ike continues at status quo. It remains a large system with the tropical storm wind field extending well away from the circulation center. Dry air from a high over northern Mexico continues to be fed into the western part of the circulation. This is helping Ike not strengthen at this time. Ike has a very low pressure indicative of nearly a cat 4 hurricane! 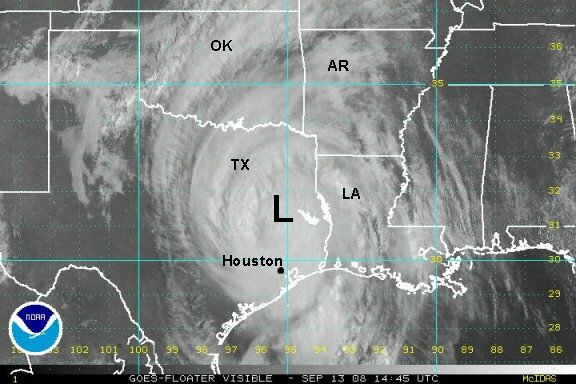 It is very interesting to note that Gustav similarly had a very low pressure without the strong winds that would be expected. Ike has the potential to do a <b>tremendous</b> amount of damage if it actually strengthens into a true cat or 4 before landfall. Pray that the dry air continues to disturb the circulation! High Winds Hurricane force winds extend out to 115 miles from the center, and tropical storm force winds out to 255 miles from the center. Storm Tides Already 3-5' in the tropical storm warning area. Storm tides of 20' can be expected where Ike makes landfall and to the northeast of there. Additionally, large waves will be added to the tides. Rainfall/Flooding The coastal areas from Florida to Louisiana will see outer bands producing locally heavy rain of 1-2". A heavy rain threat will develop Saturday into Sunday from central Texas into Oklahoma. Seas Buoys now are measuring seas over 25' in the northeastern and northcentral Gulf of Mexico. Seas up to 40' are possible near the center of the hurricane. The models are clustered near Freeport with a landfall that is still looking like late Friday night or early Saturday morning. Remember that the effects will be far removed from the center, especially on the northern side of the circulation. Stay updated with the latest forecast. Next update:Thursday Afternoon. Ike is centered at about 26.0 N / 89.4 W or about miles east southeast of Galveston, TX. Top sustained winds are at 100 mph as of the 4 pm cdt advisory. Ike is moving wnw at 10 mph. Pressure is 950 mb. Ike still not has changed much structurally. It is still fighting dry air to the west of the circulation. Outflow aloft is excellent in all areas except for the western side. Ike has a very low pressure that is not being represented well in the observed surface winds. Ike's pressure is representative of a solid cat 3 hurricane. The winds are near a minimal cat 2. 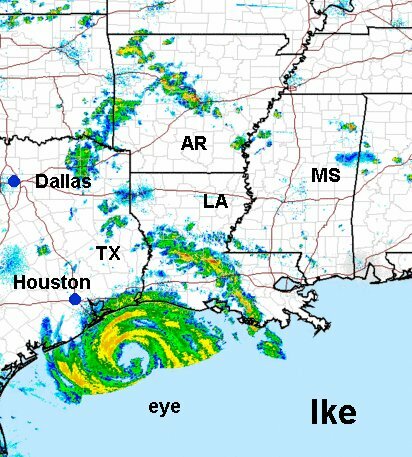 Even so, Ike is a very large hurricane. The outflow extends from the Southeast U.S. to Central America. 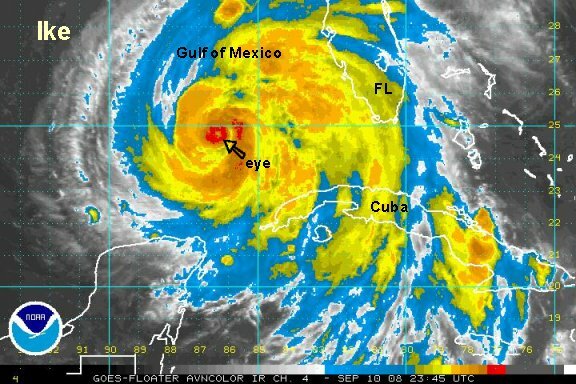 This size of a hurricane has increased water levels throughout the Gulf of Mexico. High Winds Hurricane force winds extend out to 115 miles from the center, and tropical storm force winds out to 275 miles from the center. Storm Tides Storm tides of 20-25' can be expected where Ike makes landfall and to the northeast of there. Additionally, large waves will be added to the tides. Rainfall/Flooding The coastal areas from Florida to Louisiana will see outer bands producing locally heavy rain of 1-2". A heavy rain threat will develop Saturday into Sunday from central Texas into Oklahoma. Totals of 5-10" are likely in the pathway of Ike. Seas Buoys now are measuring seas 21-26' in the northeastern Gulf, down from 28' earlier. In the northcentral Gulf of Mexico, seas are running 26', down from 28' earlier. A buoy in the central Gulf recently reported a wave height to 30'. Seas up to 40' are possible near the center of the hurricane. The forecast has shifted northward toward Galveston as the landfall location. Remember that the effects will be far removed from the center, especially on the northern side of the circulation. Ike is a huge hurricane that is causing large wave and flooding on parts of the northcentral Gulf coast. The storm tide and breaking waves will be very high near the landfall point and northeast. Wind will not cause catastrophic damage at this point. <b>If</b> Ike's winds actually strengthen to a true cat 3/4, winds will become a huge factor in causing damage too, and will increase the storm tide and flooding damage as well. Stay updated with the latest forecast. Next update:Thursday late evening. Ike is centered at about 26.3 N / 90.4 W or about 340 miles east southeast of Galveston, TX. Top sustained winds are at 100 mph as of the 10 pm cdt advisory. Ike is moving wnw at 12 mph. Pressure is 956 mb. 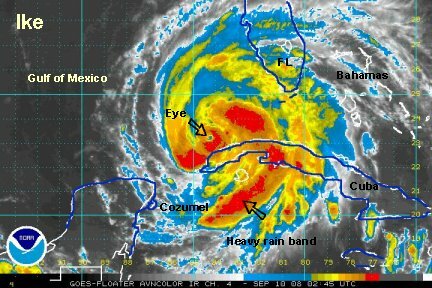 The hurricane remains extremely large and fills up almost the entire Gulf of Mexico. The dry air which has been nipping at its west side is now disappearing. Outflow aloft is now excellent in all quads for strengthening. The inner core remains very peculiar. There is a zone of deep convection near the core of the hurricane. Usually with a hurricane like this (pressure 956 mb), a solid thick eyewall would be present. In Ike's case there are deep convective bands well away from the center. If Ike does take a shot at strengthening, its theses bands that would need to solidify and contract to form the thick eyewall. Also, there still remains a few pockets of dry air intermingled with the circulation, disturbing strengthening. High Winds Hurricane force winds extend out to 115 miles from the center, and tropical storm force winds out to 265 miles from the center. Storm Tides Storm tides of 20' can be expected where Ike makes landfall and to the northeast of there. Additionally, large waves will be added to the tides. Rainfall/Flooding The coastal areas from Florida to Louisiana will see outer bands producing locally heavy rain of 1-2"+. A heavy rain threat will develop Saturday into Sunday from central and northeast Texas into mostly the eastern half of Oklahoma. Totals of 5-10" are likely in the pathway of Ike. Seas Buoys now are measuring seas at 17' in the central Gulf near where Ike passed. The seas were measured at 30' before the arrival of the low. Also, seas were down from 27' to 23' at a buoy 64 nm south of Mobile, AL. Seas up to 40' are possible near the center of the hurricane. 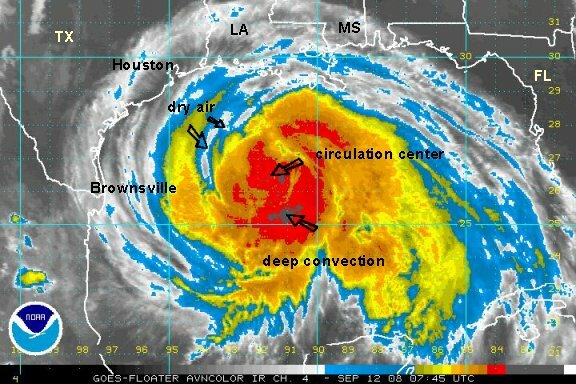 The landfall location is still in the vicinity of Galveston, TX. Remember that the effects will be far removed from the center, especially on the northern side of the circulation. Ike is centered at about 26.7 N / 91.6 W or about 265 miles southeast of Galveston, TX. Top sustained winds are at 105 mph as of the 4 am cdt advisory. Ike is moving wnw at 13 mph. Pressure is 953 mb. Ike looks as though it is finally trying to become better organized. Deep convection is building near the center of circulation as a partial eye wall is developing. The cloud tops are also cooling as a solid CDO (solid cloud mass around the eye) trys to form. 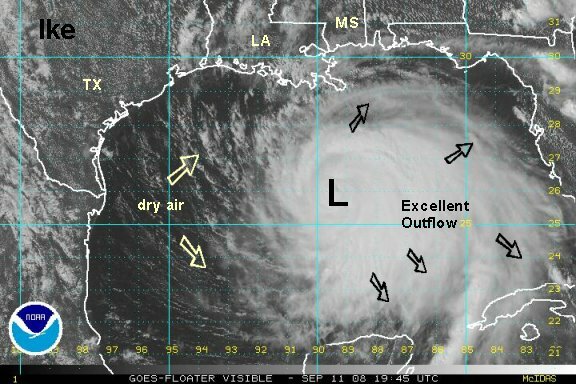 Outflow aloft still appears to be in excellent shape for development. With plenty of warm water and only weak northerly wind shear, strengthening is becoming more likely. There are still a couple of pockets of dry air that possibly could disturb the strengthening. High Winds Hurricane force winds extend out to 120 miles from the center, and tropical storm force winds out to 275 miles from the center. An oil platform measured an 89 mph wind gust recently. (That was way up at 122 meters or 400 feet). Rainfall/Flooding The coastal areas from Florida to Louisiana will see outer bands producing locally heavy rain of 1-2"+. A heavy rain threat will develop Saturday into Sunday from central and northeast Texas into mostly the eastern half of Oklahoma. Totals of 5-10"+ are likely in the pathway of Ike. Seas Buoys now are measuring seas at 27' in the central Gulf near where Ike passed. The seas were measured at 30' before the arrival of the low. Also, seas are still near 24' at a buoy 64 nm south of Mobile, AL. Seas up to 40' are possible near the center of the hurricane. Ike is centered at about 27.4 N / 93.1 W or about 165 miles southeast of Galveston, TX. Top sustained winds are at 105 mph as of the 1pm cdt advisory. Ike is moving wnw at 12 mph. Pressure is 957 mb. Dry air and northerly wind shear have returned as Ike as taking a shot at strengthening. The eye is now clearly discernible, but dry air is disturbing the western side of the circulation. This change is noted in the pressure where the pressure started to drop in the preceding hours, but now is on the way up again. Very deep convection continues on the eastern side of the hurricane and that is associated with the strongest winds. Ike will either go one of three ways. 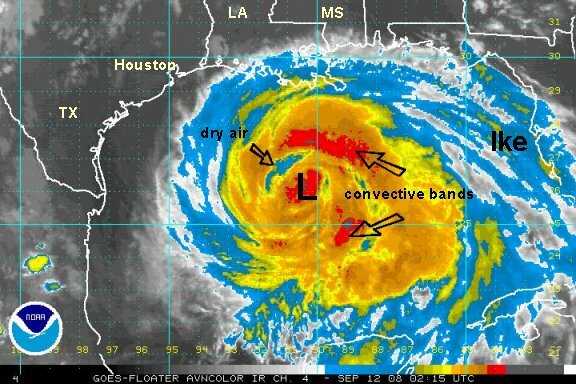 1. the dry air will continue to disturb the hurricane's eye structure and allow the winds to come down. 2. The deep convection will wrap around allowing for deepening to resume. 3. The shear and dry air vs. the deep convection battle continues keeping the status quo. High Winds Hurricane force winds extend out to 120 miles from the center, and tropical storm force winds out to 275 miles from the center. An oil platform measured a 125 mph wind gust earlier, now down to 67 mph. (That was way up at 122 meters or 400 feet and not representative of the surface wind). Rainfall/Flooding A heavy rain threat will develop Saturday into Sunday from central and northeast Texas into mostly the eastern half of Oklahoma. Totals of 5-10"+ are likely in the pathway of Ike. Seas Buoys now are measuring seas at 25' in the central Gulf near where Ike passed yesterday. Other buoys: Off of Galveston...19', ne 45 mph gust, off of Freeport...13' , n 43 mph gust. Seas up to 40' are possible near the center of the hurricane. Ike is centered at about 28.2 N / 93.8 W or about 100 miles southeast of Galveston, TX. Top sustained winds are at 110 mph as of the 6 pm cdt advisory. Ike is moving nw at 13 mph. Pressure is 954 mb. Ike continues to be in a battle of the dry air and shear vs. the deep convection building around the core of the hurricane. 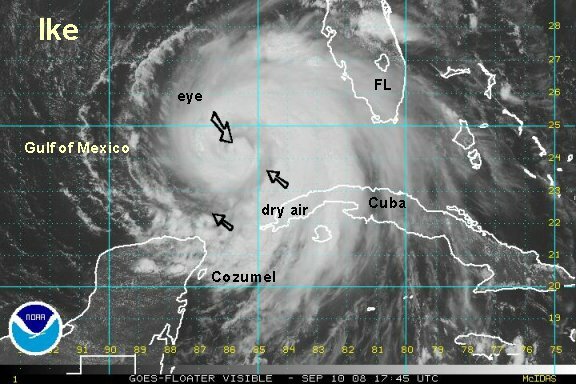 The dry air penetrated the eye wall recently effectively halting development. Soon after this, another deep burst of convection formed and now is trying to wrap around the center to close off the eyewall again. It appears that Ike will take another shot at strengthening late this afternoon. Ike is still a very large hurricane resulting in a water rise already inundating some coastal communities in southwest Louisiana and the upper Texas coast. High Winds Hurricane force winds extend out to 120 miles from the center, and tropical storm force winds out to 275 miles from the center. An oil platform measured a 105 mph wind recently. (That was way up at 122 meters or 400 feet and not representative of the surface wind). Storm Tides Storm tides of 20' can be expected where Ike makes landfall and to the northeast of there. Additionally, large waves will be added to the tides. Coastal communities are being inundated with sea level rise now and will get much worse into tonight. Seas Seas measured by buoys: 22nm East of Galveston...19', ne 50 mph gust, 60 nm south of Freeport...13' , n 45 mph gust. 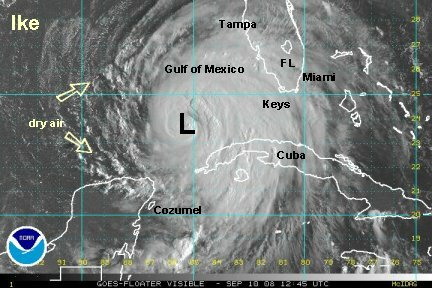 Seas up to 40' are possible near the center of the hurricane. 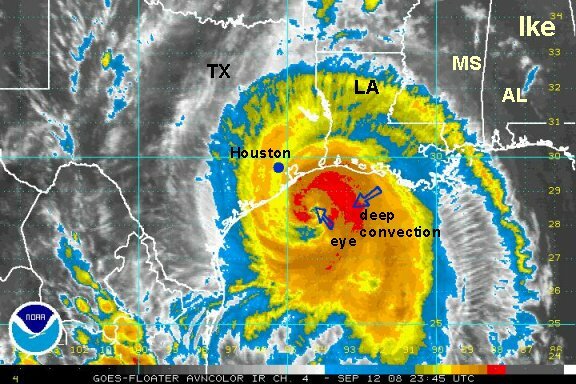 The landfall location is still in the vicinity of Galveston, TX or a little south of there. Remember that the effects will be far removed from the center, especially on the northern side of the circulation. Water level rise is increasing on the upper Texas and southwest Louisiana coast. If you live near these areas you must get to safety. There is not much time left before the winds pick up and the water rise much faster. Ike is centered at about 28.5 N / 94.3 W or about 65 miles south southeast of Galveston, TX. Top sustained winds are at 110 mph as of the 9 pm cdt advisory. Ike is moving nw at 13 mph. Pressure is 953 mb. High Winds Hurricane force winds extend out to 120 miles from the center, and tropical storm force winds out to 275 miles from the center. Rainfall/Flooding A heavy rain threat will develop Saturday into eastern Texas. The rain will move toward the eastern half of Oklahoma and western Arkansas Saturday night. Late Saturday night, the rain will move into Missouri and Illinois. Totals of 5-10"+ are likely in the pathway of Ike. Tornadoes Tornado warnings are now in Louisiana. Tornadoes will continue into Saturday in eastern Texas and Louisiana. A tornado watch is in effect until 10 am cdt for western Louisiana and eastern Texas. Seas Seas measured by buoys: 22nm East of Galveston...19', ne 50 mph gust, 60 nm south of Freeport...18' , n 58 mph gust, Galveston Bay north jetty - gust to 67 mph. 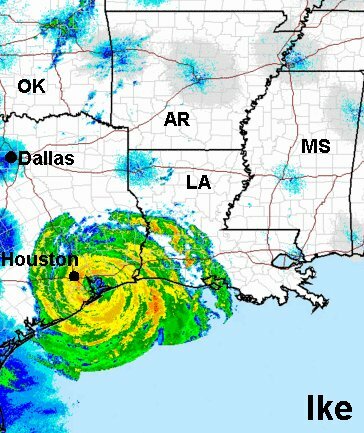 The landfall location now looks to be near or just east of Galveston, TX as Ike has begun to turn. Remember that the effects will be far removed from the center, especially on the northern side of the circulation. Water level rise will continue to increase rapidly over the next couple of hours. Remain in a location of safety. Remember, if you are in the eye of the hurricane, winds will go calm or nearly calm. The winds will pick up just as strong from the opposite direction as the eye passes by. 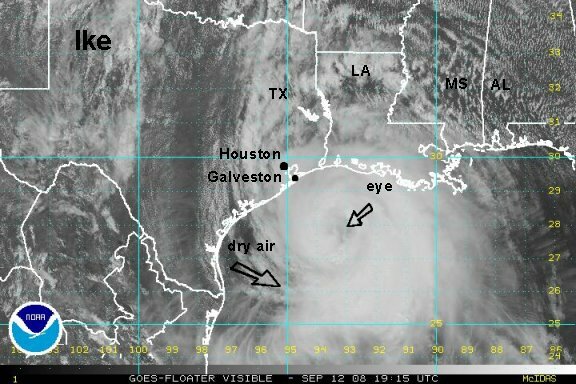 The eye will likely pass near or just to the east of Galveston and Houston over the upper Texas coast late this evening around midnight. Ike is currently over Galveston Bay. It made landfall officially at Galveston, TX at 2:10 am cdt. Ike has a very large eye again. In our opinion, sustained winds are about 85 mph. 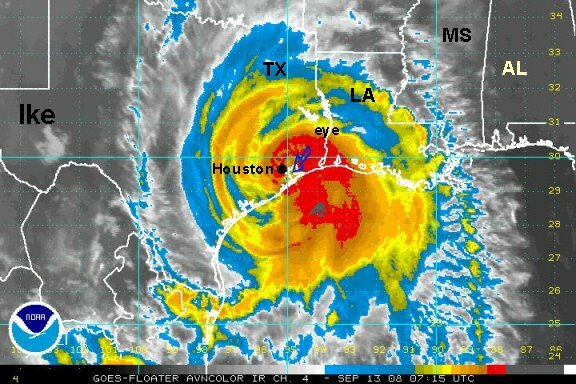 We don't believe that Ike was a 110 mph hurricane at landfall. Some gust were reported near 100-105 mph. Gusts usually are 15-20% above the sustained winds. NHC usually writes advisories for the gusts, when it should be for the sustained winds. We also believe, as verified by the Hurricane Hunters for the last 24 hours, that winds were much stronger 200-300 feet above the ground. This is very important because some of the buildings in Houston are very high and may actually get winds of 110-120 mph on the upper floors. This will cause a huge amount of damage with the windows that get blown out. The sea wall in Galveston was also topped. Water up to 6' deep was reported at the Courthouse. There is going to be a tremendous amount of flood damage on the upper Texas coast and the southwest coast of Louisiana where the storm tide has inundated the region. The forecast still calls for Ike to move through northeast Texas today. Wind damage and power outages can be expected in eastern Texas. The heavy rain band of 5-10" or more will move into eastern Oklahoma and western Arkansas by this evening. Saturday night into Sunday the rain will spread across Missouri and Illinois. Rain amounts will be somewhat less, in the range of 3-6". The tornado threat will spread from Louisiana and eastern Texas into Arkansas today and even farther north by Saturday evening. Stay updated with the latest forecast. Next update:Saturday Midday. Thanks for visiting and stay safe! Damage assessment will begin on the upper Texas coast and into eastern Texas and western Louisiana. Many thousands of homes and businesses have been flooded out or damaged due to wind. Many in this area will be without power for awhile. Ike is now inland and probably no longer a hurricane. Officially it is 80 mph as of the 10 am cdt advisory from NHC. After checking the land and sea reports, it appears that the winds generally are in the 45-55 mph range. Some gusts could be as high as 65 mph. NHC is usually very slow in bringing the winds down. Ike now is primarily going to be a flooding threat and tornado threat. Remember, it only takes a couple of feet of water to move a vehicle. Don't drive through flooded roads. Also, a tornado watch is in effect for eastern Texas, southern Arkansas and western Louisiana until 7 pm cdt. There have been recent tornado warnings. Ike continues to move through northeast Texas today. Some areas of wind damage and power outages can be expected in eastern Texas where winds exceed 50 mph. The winds will die down over land soon, and most locations are probably near or under 50 mph at this time. Heavy rain of 5-10" or more will move into eastern Oklahoma and western Arkansas by this evening. Saturday night into Sunday the rain will spread across Missouri and Illinois. Rain amounts will be somewhat less, in the range of 3-6". St. Louis should be in the heavy rain overnight Saturday night into Sunday morning. The tornado threat will spread from Louisiana and eastern Texas into Arkansas today and even farther north by Saturday evening. Since Ike is now well inland and should be downgraded to a tropical storm soon, this will be our last update on Ike. If you have any comments concerning our coverage please pass them on. Thanks!